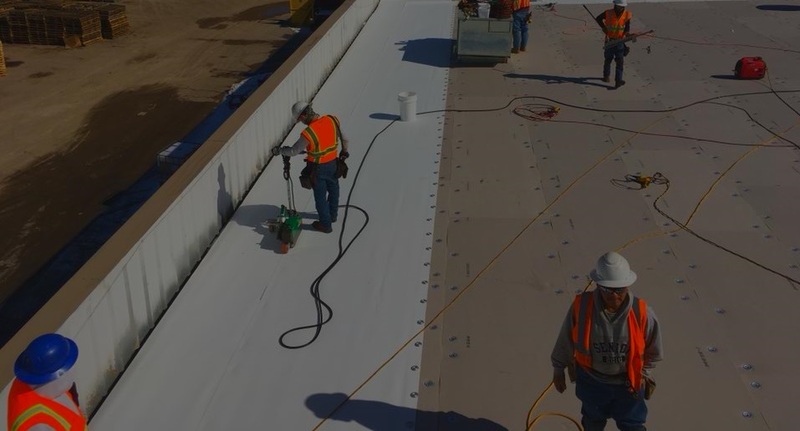 The low price and easy-to-install nature of TPO roofing makes it the most desired roofing membrane for low-sloped buildings. The mil thickness ranges from 40 mils to 80 mils. As TPO is highly energy efficient, this further drives demand as it brings down costs over time. The low price and easy-to-install nature of TPO roofing makes it the most desired roofing membrane for low-sloped buildings. Polyvinyl Chloride (PVC) roofing is created using the same material as PVC pipes we are all familiar with but has the added benefit of using plasticizers. This makes the material pliable and usable for roofing membranes. PVC roofing is similar to TPO roofing in that it uses a base and top ply synthetic rubber with a polyester-reinforced middle layer. The benefits of PVC roofing are similar to those found in the PVC pipe cousin. PVC roofing is the strongest of these single-ply systems. It can be custom fabricated to produce seamless and is reinforced right out of the box. The added benefits make this roofing system a little more expensive, but the extra piece of mind knowing you have an incredibly strong roof may be well worth it. 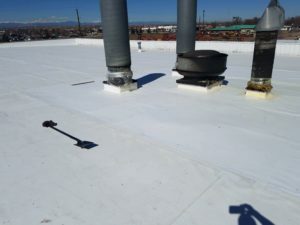 Ethylene Propylene Diene Monomer (EPDM) is a synthesized elastomeric compound that creates a synthetic rubber roofing membrane and is a popular option for low-slope commercial roofs. The main ingredients are ethylene and propylene, the E and the P in EPDM, and a small solution of a diene monomer, the D in EPDM. The reasons for this roofing membrane’s popularity are simple. EPDM roofing thicknesses ranges from 45 mils to 90 mils, and has a width range of 7.5 feet to 50 feet. 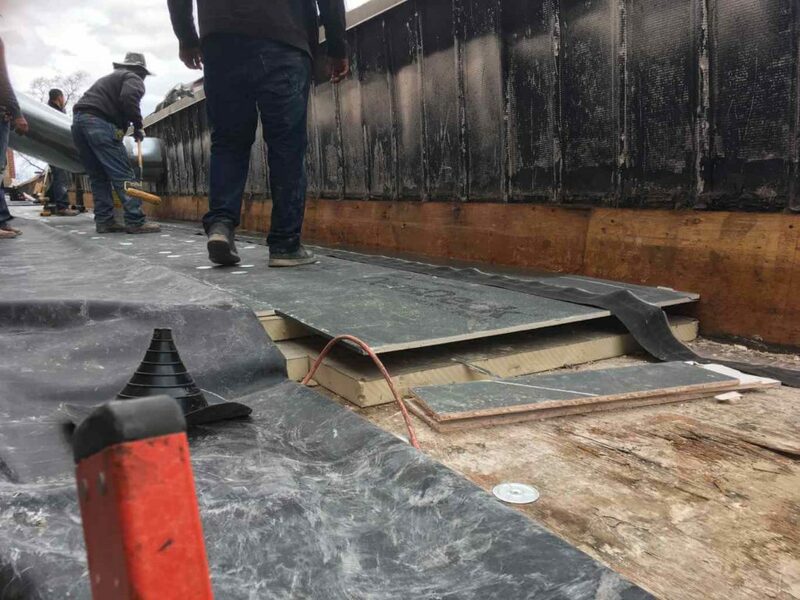 The versatility of the EPDM roof membrane makes it an easy choice for many low-slope roof pitches while keeping the cost affordable. *EPDM roofing membranes are also offered in white for extra reflectivity. To extend the mil range for TPO, PVC, and EPDM membrane sheets beyond normal specifications, ask for Fleece Back roofing. The normal top-range for single-ply roofing membranes is 90 for PVC and EPDM, and 80 for TPO roofing. With fleece back roofing, the ranges extend to 135 mils for both PVC and EPDM, and up to 155 mils for TPO. That’s a 50% increase for PVC and EPDM, and a 93% increase for TPO. Those are substantial numbers, but what does that mean for you, the customer. You get more for your money with Fleece Back roofing membranes. To see a roof finished but dirty because of scuffs and dirt accumulation can be frustrating. It may look as if nothing changed at all. You know that your new roof is in excellent shape, especially if Modern Roof installed it, but it may not look that way. So much for showing off to the neighbors. Carlisle’s patented Apeel Protective Film technology has a solution for your dirty roof. *Keep in mind that TPO roofing is currently the only roofing membrane using this technology. After installation and clean-up our crew strips the Apeel protective film technology to reveal a sparkling and new looking TPO roof. If you’re missing the intended pun in the word Apeel, fret not, you’ll understand when you see your new roof. Call up the neighbors and show them to your roof. It’s bragging time. 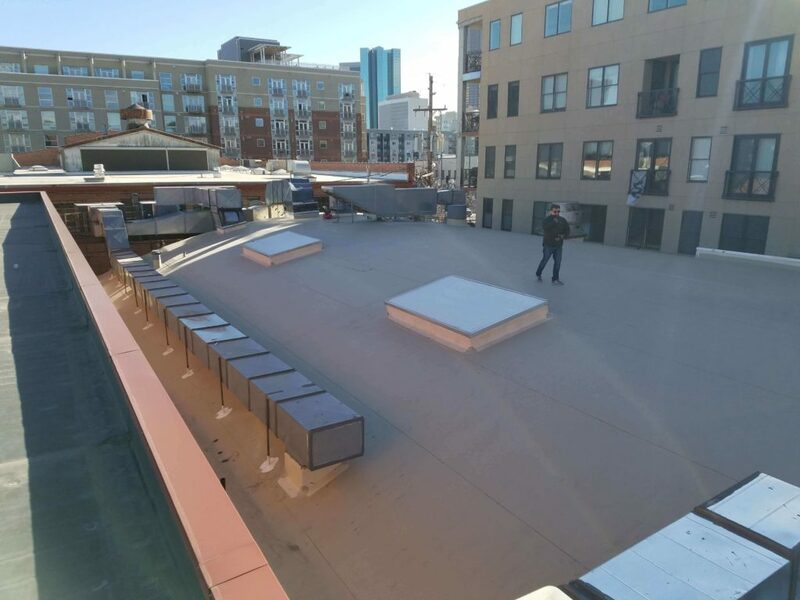 If you attended the 2018 International Roofing Expo, then you may have seen the RapidLock Roofing System win Best Commercial Product. In a collaboration between Velcro and Carlisle Syntec, the RapidLock Roofing System uses Velcro to adhere membrane sheets. Typical installation requires using some sort of adhesive, such as glue, to install the roofing membranes. This process can be tedious and relies on proper weather conditions for correct installation. Using Velcro saves time and labor on the installation process and RapidLock allows installation in ALL weather conditions. Yes. ALL. For you property owners who are worried about staying on-schedule because of wild weather (we do live in Denver), a Velcro solution might help put your worries at ease. RapidLock is odor-free, lacks a temperature restriction for application, and the absence of glue can potentially boost your points towards a LEED certification. 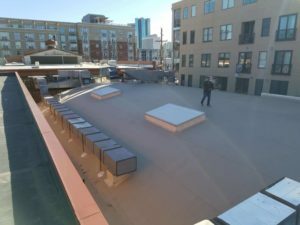 This Velcro roofing system is ready for application today and Modern Roof Co has the necessary connections to make it happen. When you’re looking for a single-ply roofing membrane solution, Modern Roof Co is the answer. We provide many commercial roofing services and offer a free inspection to all our customers. Call or contact us today.